Vertical cracks, cankers (holes where the bark is missing), deadwood (dry brittle wood that easily breaks apart), or no bark are all signs that your tree may be dying, sick, or has damage. As healthy trees age, old bark naturally falls off and is replaced with a new layer of bark. If no bark reappears and you are left with smooth wood around your tree’s trunk it is a sign that it is unhealthy and dying. 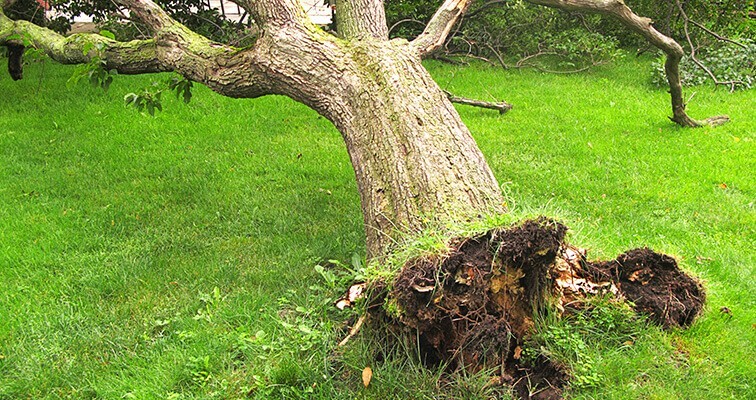 If you see signs of trunk damage it is important to call Tommy’s Tree Service today to schedule a visit from one of our experienced arborists in Austin, Texas to thoroughly inspect the health of your tree. Do you see large fungi growing on the trunk or branches of your tree? If so it could be a sign that your tree has internal rot. As expert tree doctors, we are dedicated to inspecting and diagnosing the health of the trees on your property. Our team of highly skilled and trained arborists can identify any internal rot, diagnose tree diseases, and will always keep the safety of your family and home in mind. Even though roots are below ground and most signs of damage are difficult to detect some visual signs of root damage like a sudden and noticeable lean or small branches sprouting near the base of the trunk are easier to identify. The growth of these small branches are known as epicormic shoots and is a sign that your tree is under severe stress. In these instances, it is important that one of our tree experts access the health of your tree and determine whether the tree is dying and needs to be removed. Determining the health of your tree’s branches is most easily identifiable in the spring time since that is when leaves come in. If more than a third of your tree is bear it is a sign that your tree may be dying and will need to be removed. It is also important to keep in mind that healthy deciduous trees (oak trees, maple trees, hickory trees, or any other type of tree that loses their leaves in the fall and regrows in the spring) with leaves that are dead will naturally drop to the ground, but if the dead leaves cling to the branch it is a sign that the branches are dead and should be removed. A tree decays from the inside out so it can be difficult to identify but a few signs to look out for are fungi growth, soft and crumbly wood, sawdust, or the appearance of carpenter ants. Tree decay is extremely dangerous and the process of removing a dying tree will need to begin immediately if you notice any signs of decay. Even though a tree with a hollow trunk can still live since the support tissues are located throughout the outer edges of the trunk the strength of your tree is severely compromised and poses a safety hazard. Trees with hollow trunk are at risk of falling and should be removed immediately. Any lean that is fifteen percent or more will need to be scheduled for our emergency tree removal service. Call Tommy’s Tree Service today to determine the safety of your leaning tree and access the need to immediately remove it from the premises. If you can visibly see that your tree’s roots are damaged or decaying it is vital that your tree is removed as soon as possible since the tree has lost structural support and may fall at any time. Branches with dead leaves or missing bark will need to be removed immediately and should be scheduled for our emergency tree care services since they pose a safety threat and may suddenly fall. While one of our expert arborists are on the premises we will also inspect the rest of your tree to ensure that it is structurally sound and is healthy.